JUBA, May 12 2014 (IPS) - Twenty-year-old Wani Lo Keji stares at the sky as his herd of cattle drink water from the eastern bank of the Nile River, just opposite South Sudan’s capital, Juba. “We bring our animals here everyday because the seasonal river near our village has dried. There were many herders fighting for water there,” he tells IPS. Lo Keji’s problem is nothing out of the ordinary in a country where livestock outnumber the population. South Sudan has an estimated 11.7 million cattle, 12.4 million goats and 12.1 million sheep in a country of around 13 million people, according to statistics from the Ministry of Agriculture, Forestry, Tourism, Animal Resources, Fisheries. While South Sudan’s livestock population is estimated to have an asset value of 2.2 billion dollars — the highest per capita holding in Africa — Isaac Woja, a natural resources management consultant, tells IPS that these livestock are not being managed sustainably and are causing both water scarcity and environmental degradation. 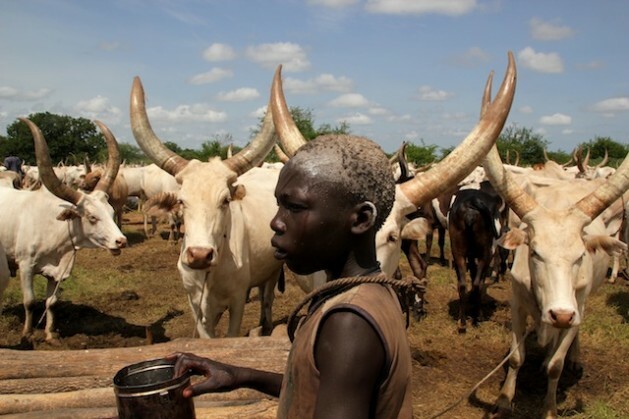 “Cattle in South Sudan are a curse. It is not a resource that benefits the people because they are not rearing cattle for economic benefits or for food security benefits. They are rearing it for prestige. “They just want to have many cattle so that they are respected in their communities on account for having the largest number of livestock in their area. That’s why in the dry season you find scarcity of water and pasture,” Woja adds. In South Sudan, cattle are revered and there are communities where pastoralists won’t even contemplate slaughtering one of their cows for meat. So the country imports cattle, mainly from neighbouring Uganda, which is then slaughtered for meat. According to the African Development Bank, 80 percent of the people here live in rural areas and rely on agriculture, forestry and fisheries for their livelihoods. In many South Sudanese communities cows are mostly used to pay a bride wealth or dowry and as compensation in cases of murder or adultery. “Cattle herders are proud of the quantity rather than the quality of the cattle they keep. This is leading to overgrazing on the land,” Justine Miteng of the Dutch development agency, SNV, tells IPS. She explains that as a result water resources are also being misused. “People come to water bodies to water their animals and cause damage to the river beds. The animals and the the pastoralists also defecate in the water, which in a way pollutes the water,” adds Miteng. Woja adds that overgrazing and the resultant soil erosion is also an issue. “For example, if you can only graze three cows on half a hectare, you will find someone has 100 heads of cattle on that piece of land,” Woja explains. To ensure animal resources are managed sustainably, Miteng says, there needs to be regulations about the number of animals pastoralists can own on a given piece of land. “You can at the same time harvest grass to make hay that you can use over a period of time when there is no live grass,” Miteng says. Woja adds that to ensure sustainability, there should also be regulation in terms of how a specific piece of land should be used to rear cattle. “If you have a big piece of communal land you should be able to divide it into paddocks so that you know this year you are grazing on this piece and the next year you will graze on another piece of land,” Woja says. The unregulated exploitation of the land is due in part to a lack of clear policy from the government, according to Leben Nelson Moro, a professor of development studies at Juba University. According to Moro, too much focus has been placed on the extraction of oil — oil contributes to 98 percent of South Sudan’s revenue — and the population pressure exerted by the large numbers of South Sudanese who returned from exile after the country’s independence. “We need proper planning and policies. We should identify what natural resources we have and prepare good policies guiding how they should be used … to benefit the current and future generations. There should be a national plan to do that,” Moro tells IPS. The government should also engage universities to carry out studies on how the country’s resources can best be managed in order to avoid exploitation, Moro adds. “However, civil society should be there to check the government, which normally has its eye on the short-term benefits of exploiting natural resources rather than the long-term impact on communities,” Moro says. But until this is done, people like Lo Keji and his family will keep procuring livestock for prestige. “In our family we have four hundred animals and we are working hard to buy more,” Lo Keji says.